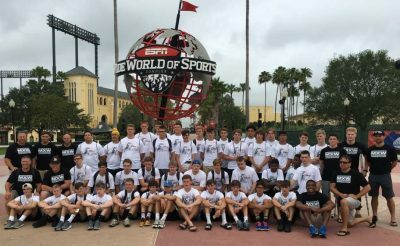 A big part of forging champions for Coach Brad Harper’s Penn High School Wrestling Team is participating in the Disney Duals at the ESPN Wide World of Sports Center in Florida. Nearly 5,000 wrestlers compete in three divisions, featuring 50 All-Star Teams, 300 community teams, 200 developmental teams. Penn sent three community teams to compete at the Disney Duals, which is one of the top national dual tournament settings. Penn had several breakthrough wrestlers earn All-American status — Nate Hadary 106, Jeffrey Harper 138, Tanner DeMien 120, Jai Pant 113, Alex Slates 120, Adam Berta 220, and Vince Spearow 106. Each of Penn’s three teams placed in the Top 16 at the Disney Duals, a remarkable achievement. Preston Risner said that the experience benefitted.